The Last Punisher is a bold, no-holds-barred first-person account of the Iraq War. With wry humor and moving testimony, Kevin Lacz tells the story of his tour in Iraq with SEAL Team Three, the warrior elite of the Navy. This legendary unit, known as 'The Punishers,' included Chris Kyle (American Sniper), Mike Monsoor, Ryan Job, and Marc Lee. These brave men were instrumental in securing the key locations in the pivotal 2006 Battle of Ramadi, told with stunning detail in this book. Minute by minute, Lacz relays the edge-of-your-seat details of his team's missions in Ramadi, offering a firsthand glimpse into the heated combat, extreme conditions, and harrowing experiences they faced every day. Through it all, Lacz and his teammates formed unbreakable bonds and never lost sight of the cause: protecting America with their fight. 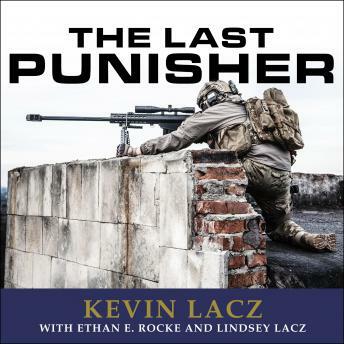 The Last Punisher brings the listener into the life and mind of a SEAL, demonstrating the tough realities of war. At the same time, Lacz shares how these experiences made him a better man and how proud he is of his contributions to one of this country's most difficult military campaigns. im sure the story is sensational, but i cant get past the narrator. Im unable to finish the book because of it. maybe ill try again in a few months. Great read, easy to tie into the other books from the punisher seals. I once heard a wise man state that vile cursing shows a real lack of a good education. Love the book, the narrator is eh.